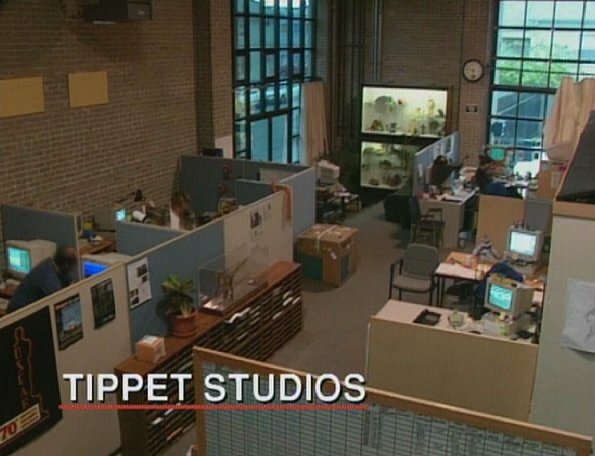 "When I went to ILM, my next stop was to go across the bay to the Garage, sloppy, crazy, creative and wonderful shop of Phil Tippett." 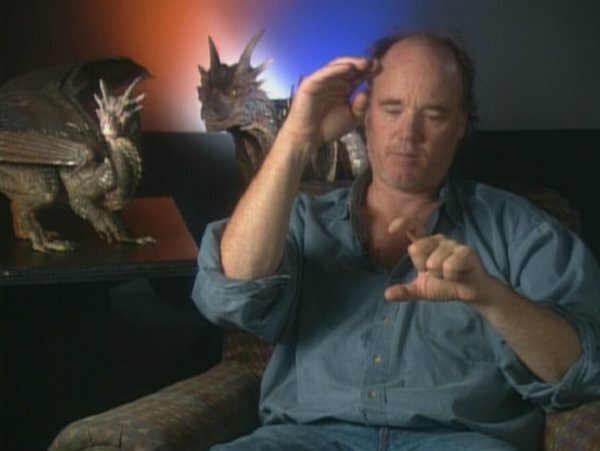 "Our initial involvement in Jurassic Park was from the point of view of overall direction and choreography and developing of the sequences. Our primary responsibility on Dragonheart was more to design, come up with the look of the dragon itself and then begin to, in the context of the character design, block out some of the initial sequences using animatics in which we create very rough moving storyboards that further delineate the action that is indicated in the storyboards but really create the blocking and the timing of the sequence." "We went into a whole long series of things and Phil said, "You know, the place we should start is with the Foo Dog." With the temple guardian dog of Buddhist shrines which is a lion mane... It's half lion, half dog. And the Foo Dog, the beautiful thing about it, has a certain lion-like elegance, a fierceness but it's ultimately an incredibly proud and visual... visually powerful creature." "But then we went back and forth on the aspects of it. The heavy chest and the head that wasn't on a long neck. You know, compress the neck. And I was thinking also a great deal about the release format of the film, what the rectangular frame was going to be. 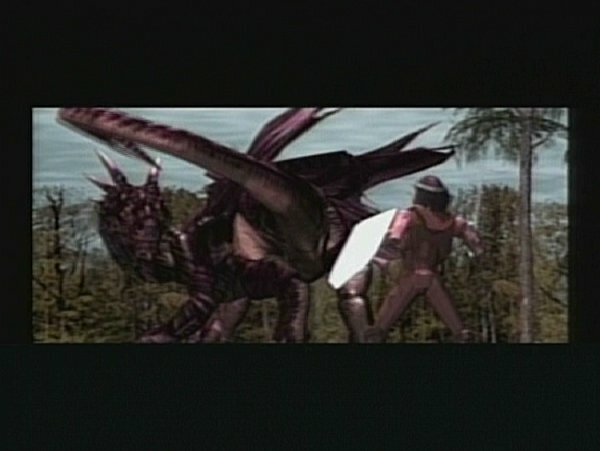 And so a great deal of the dragon design was taking that into account as well, how it would be framed on a shot-to-shot basis. You know, working in conjunction with... it's a buddy picture, and one buddy is this big and the other is that big. You're gonna have problems in framing the shots. So, "What kinds of things can the dragon do? ", really became an issue. You can't just do a drawing or a sculpture. 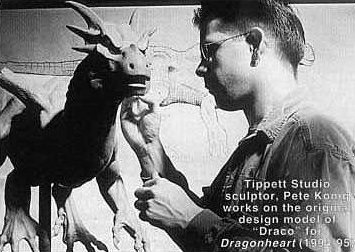 And I worked very closely with our sculptor at my studio, Pete Konig, who came up with the actual sculptures and did a great deal of the design work himself in determining what the various aspects of the dragon could be, if it was in a lying pose or if it was in an angry pose. And from this we would begin to create a number of very small clay sketches or maquettes that we would take to Rob. And there would be maybe 20 or 30 of these things. And from those Rob would choose one of Pete's sculptures and say, "This kinda feels right." 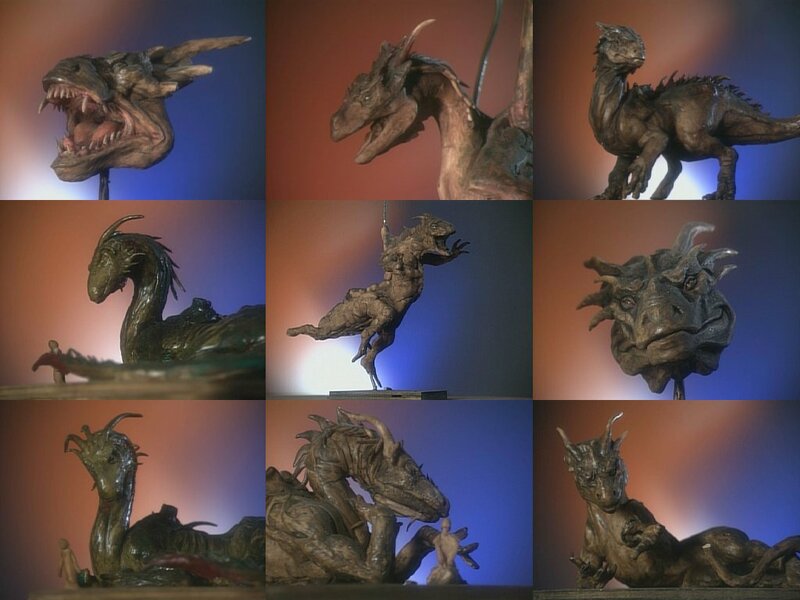 We'd take that and then we'd go back and hone it and develop it more into what ultimately became this final design maquette of the Draco character." "We went through a series of thousands and thousands of design issues. The wings, shape of the wings, his color. What shape should his pupils be? How big should the eyes be? His teeth. How old is he? Should he have cracked teeth, worn teeth? Did he get into fights? Does he have scars? All these things that I wanted to do. And to solve problems like how big he should be. 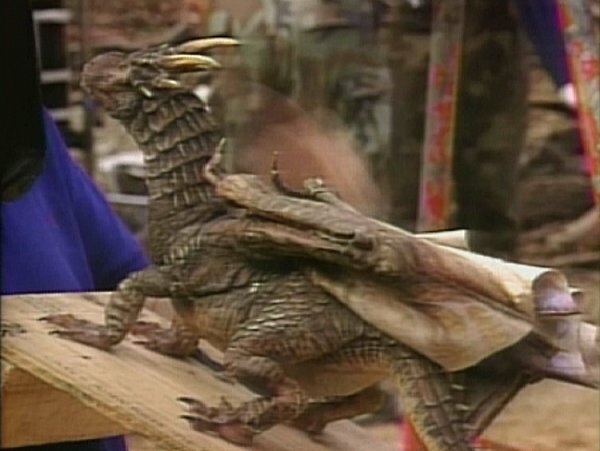 We had a scenes where Bowen and he have an epic battle, and he winds up in the mouth of the dragon. I kept drawing from nature. From boa constrictors, and I watched how they removed the pins from their jaws to open their jaws wide to swallow a creature two or three times the size of its head. And I said, "Why can't dragons have detachable jaws?" 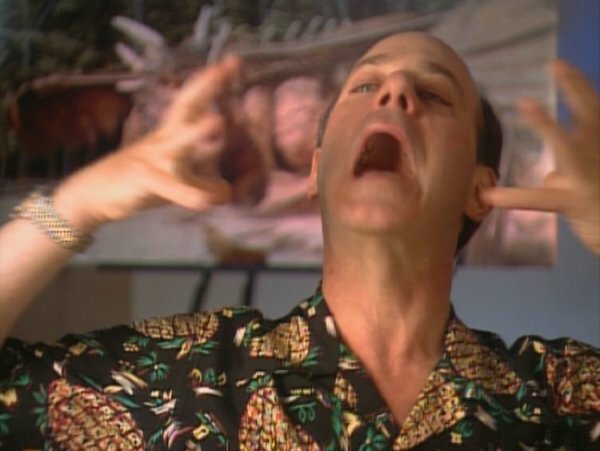 So in the scene where he swallows Bowen, before he swallows him you see the... The pins push out and the jaw distends so you could justify having a smaller head. Phil and I finally set Draco at 18 feet high and 43 feet long with a 72,3-foot-long wingspan." "Rob wanted two huge fangs for some of the scenes, particularly the scene where they have their standoff. So the the retractable teeth were not so much a problem. More a problem for us were these other interlocking teeth, how you make something with these big chompers." "Things kept falling in, working and looking at the consequences of any given physical decision. I wanted him to be like a Swiss Army knife. I wanted him to have a resting tail and a fighting tail. I felt Draco needed to use his hands. So he had to have feet and hands, not just his wings and feet. So nature is a master designer. 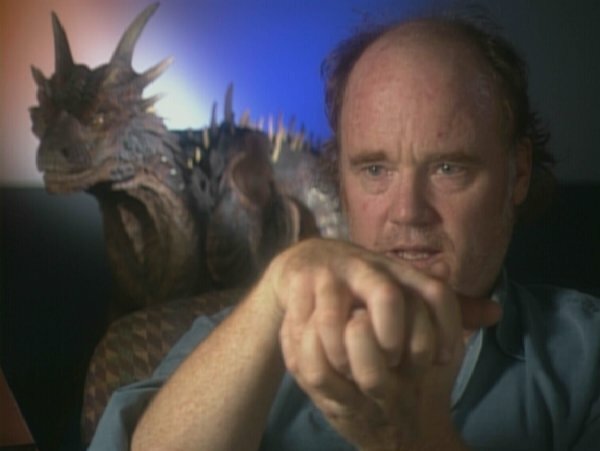 With the help of Phil Tippett and Steven Price, our first visual effects supervisor, I was able to get my dragon put together in a way that I thought was very successful, unique, and ultimately functioned well to be the first computer graphic actor." "Rob had requested a pose-able maquette. So, in addition to the five-foot model that we sent along for a lighting reference there was another - like a stop-motion model. It had an articulate skeleton in it that you could bend. It was taken from the design maquette and cast up in a rubber material that would allow him to pose it. So he could imagine the model with its tail curled around or its wings unfolded, or its head looking back the other direction. That helped explain to the crew what he was looking for."